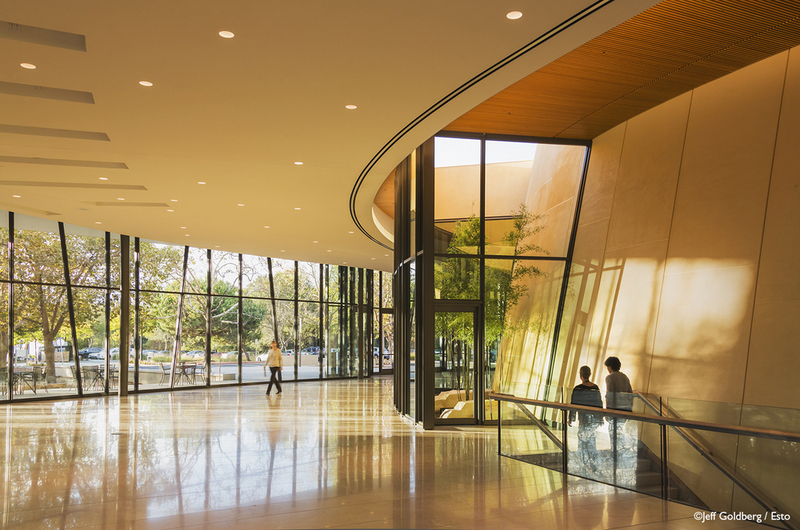 O|CB was a member of the winning competition team for the new Stanford Performing Arts center, with Ennead Architects of New York. The project, situated on a 5 acre site, includes a 900 seat Concert Hall, a Rehearsal Hall and Performers’ Suites. Site elements include an Entry Plaza, two Sculpture Courts, outdoor Event Terraces, and a private Performers’ Garden. These landscape typologies assume the dual role of extending the architecture into the landscape and creating shared spaces that contribute to the overall unity and character of the University. Visible from inside the lobby, four dramatic Light Well Gardens ring the perimeter of the Concert Hall ‘drum’. These minimal, sculptural landscapes are compositions of stone, black bamboo and light which ground the building in the landscape and provide a dramatic backdrop for pre-performance events. The BCH site is one of four original building locations flanking Palm Drive, established by the 1888 Olmsted plan for the campus; it is on axis with the University Museum. This axial relationship establishes the formal, ‘urban’ landscape character of the Hall’s west façade. The Campus Arboretum and Frost Amphitheater, to the north and south, inform the verdant, ‘pastoral’ landscape that embraces the remainder of the Hall.